Games that leave you in the dark about your opponents’ identities have been around for a while. When that is the main mechanic of the game, they’re called hidden identity games. But rarely have identities in a game been so well hidden that, half the time, you don’t even know who you are yourself. But that is exactly the level of uncertainty Bruno Faidutti creates in Mascarade, a small box bluffing game that needs nothing but 13 cards, some paper coins, and a few other paper tokens to be fiendishly fun. In Mascarade, your goal is simple: get filthy rich as quick as you can. To do that, you will take the help from anyone, from King and Queen all the way down the social ladder to the simple Peasant. Just don’t get too attached to any of them, because none of them are very loyal. Or at all loyal, really. They’ll go with just about anyone, like little kids when offered candy. Every player starts with a character card, and this is the only time you see everyone’s card. So better remember well – for all the good it does, because for the first four moves in this game, players must trade their character cards. But trading in Mascarade is not the simple, straightforward operation of “you give me your card, I give you mine”. It is “you give me your card, I hide them both under the table and then give you one of them back, but you don’t know which, and if I haven’t been paying attention, neither do I”. That last part happens to me more often than I’m happy to admit. And to make matters even worse, neither player gets to look at the card they now hold, so if you didn’t know for sure what card your trade partner had before, you now have a problem. To really make sense of things, you thus not only need a good memory, you need to deal with probabilities that someone is holding a specific card. That’s challenging with four to six players, with a full game of thirteen keeping track of who might have what with what probability probably qualifies you to join Mensa. After the first four moves, you have more options on your turn. You may still trade cards with another player as described above, or you may sneak a look at your own card – yes, looking at your card is a whole turn – or you may use the action of the card you’re holding. Or hope to be holding. Or hope to fool other people into believing you’re holding, because bluffing is at the heart of Mascarade. To take a Character Card’s action, you don’t actually have to hold that card. You don’t have to show the card unless someone contradicts you. Announce that you’re the King, take three coins. It’s that easy, if no one else stands up yelling “NO, I AM THE REAL KING! HOLD THE IMPERSONATOR!” That sort of theatrics also happens more often than I care to admit around our table. If one or more players contradict an action, then everyone involved has to show their cards. This is a good opportunity to reset your mental count of who holds what and helps you stay sane. 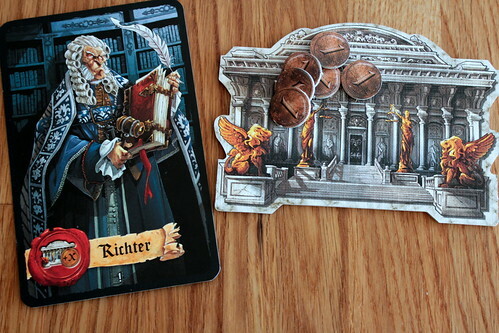 The player holding the Character Card used, even if that is not the active player, now gets to take the action. Everyone who was falsely claiming to have that card has to pay one coin to the Court. Many times, bluffing is worth the risk, though, as the actions usefulness differs widely depending on your situation. And you don’t really expect your opponents to be able to keep track of who is who, anyway. The simplest actions come from King and Queen, who let you take three and two coins, respectively. The Judge takes all fines paid to the Court so far. The Widow is powerful early in the game, but can’t win on her own: she takes coins from the bank until she has ten. Unfortunately, you need 13 to win. Unless you’re the Cheat who wins with 10 coins. Other characters’ abilities are slightly, very slighty, more involved than that. 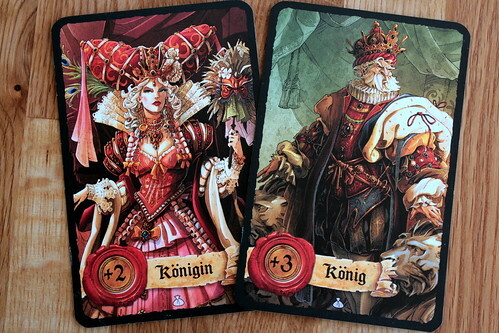 The Fool, always eager to spread chaos, switches two other players’ cards. Or not. The Inquisitor takes four gold from another player unless he correctly guesses his own character card. And the Farmers, the only character that exists twice, takes one coin, unless the other farmer reveals himself, in which case both get two coins. Oh, and the Beggar card that is in the box but not in the rules? That’s intentional, you’re invited to come up with your own ability for the Beggar. A great idea, I just wish the rules had told me that from the start.For any number of players, the rulebook gives a recommendation of which characters to use. But in the interest of more variety, you can mix available characters in almost any way you want. You just can’t go completely random because you might end up with no way to get new coins into the game. Having at least King or Queen, better yet both, is always recommended. But it doesn’t matter which characters you have in the game, as long as you have 5 or more players, Mascarade will always be fun. Usually the chaotic sort of fun, because, lets face it, you’re not going to keep track of all the cards. That’s not the point of Mascarade, the point is to bluff your way to victory better than everyone else. As rules go, it’s a very, very light game, but with the memory and bluff elements, it’s not so easy to play. You have to be on your toes. Personally, I enjoy Mascarade most with 6-8 players. More than that and my ability to know what is going on is completely overwhelmed. Less than that, and it gets too easy to keep track – uncertainty is what makes Mascarade fun. For two and three players there are some special rules to play, but you’ll have to decide for yourself if they are for you or not. 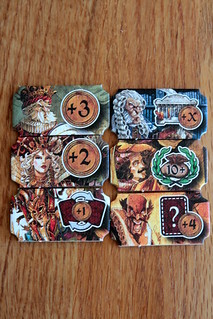 They do change the flavor of the game a lot, especially in two players it boils down to an intense mindgame of “did he switch those cards now or not?” Interesting, but I like Mascarade better in medium-sized groups, that’s where it strikes the perfect balance between chaos, bluffing and having some idea what’s going on.